Lucas, the fearsome ABA enforcer, is another vegetarian, in addition to being one of the most complete power forwards in the league; at times [Bill] Walton appears stunned when, high over the backboard, he glances across the rim to witness Lucas ripping another rebound asunder and scattering the bodies below him. “Bill’s a gorilla until the fight starts. Then he goes in hiding while I straighten things out,” Lucas says. That Sports Illustrated article accurately surmised Maurice Lucas in 1977. After decking 7’2″ Artis Gilmore in an ABA game his rookie season, the 6’9″ Lucas became the most feared enforcer in the basketball. The reputation never dissipated as Lucas continued to angrily confront other players for their transgressions against Lucas or his teammates. In fact, Lucas’ spirited confrontation with Darryl Dawkins is credited with helping swing the 1977 NBA Finals from the Philadelphia 76ers to the Portland Trail Blazers. The “enforcer” label has obscured many of Lucas’s other fine basketball qualities. The defensive ability and rebounding tenacity aren’t too surprising. A quarreling forward who defends like made and cleans the boards fits common perception. Correctly fitting that bill, Lucas, from 1975 to 1984, averaged 10.1 rebounds per game. He was also named to the All-NBA Defensive 1st Team in 1978. Although that was his only first team selection for defense, he easily could have been placed on several more. There’s only so much space to go around on those five-man squads, though. Despite his muscular and powerful presence, the Enforcer didn’t just stick to the nitty gritty details of the basketball court. Lucas was an accomplished offensive force as well. During that same ’75 to ’84 time span mentioned above, Lucas averaged 16.5 points a night. Twice he hit 20 points per game in a season (1977 and 1979). Perhaps a surprise to some, Lucas attained those points partially by virtue of a feathery mid-range jump shot that featured an elegant flick of the fingers and snap of the wrist. He employed the same aesthetic beauty when he fired outlet passes after having swung his elbows and snarled his way to securing rebounds. With that effective jumper, Lucas, especially in his younger days, was able to pump fake and traipse his way to the basket when defenders closed out too hard on him. And given that Lucas played on the 1977 champion Trail Blazers, you know he knew how to pass the ball. Again looking at his golden era of 1975-’84, Lucas routinely averaged about three assists per game. These menage of skills made Lucas highly coveted and usually brought great success to his teams. As a rookie in the ABA in 1975, Lucas – along with the wunderkind Marvin Barnes and sage veteran Freddie Lewis – led the upstart Spirits of St. Louis to a startling 4-1 upset of the defending ABA champion New York Nets before losing to the Kentucky Colonels in the Eastern Finals. The Colonels seemed so impressed with the young Lucas they traded for him the next season. The ABA’s absorption by the NBA in 1976, though, coupled with the liquidation of the Colonels made Lucas up for grabs for NBA suitors. The Trail Blazers swooped in and got the talented, rock steady Lucas to pair in the front court with oft-injured Bill Walton. The duo meshed perfectly on court and pressed Portland to the NBA title in 1977. However, Maurice couldn’t help but notice Walton received the lion’s share of adulation for the team’s success. The Blazers were generally a finessing team protected physically and mentally by Lucas. Coupled with his All-Star status (achieved in 1976, 1977, 1978, and 1979), Lucas grew restless and finally disgruntled with Portland management. Talks over a new, larger contract never went far and Lucas demanded a trade from Oregon. The Blazers obliged midway through the 1979-80 season. Unfortunately, things were never quite the same for Mo afterwards. Well, he still fought and scraped a lot, but he never again found the same synergy elsewhere as he did with the Blazers. Intelligent and opinionated, Lucas was indeed not the kind of athlete management liked to have around. Thus he bounced around to five different franchises over the last eight years of his career. His days in New York and New Jersey were brief and largely forgotten. He enjoyed a renaissance in Phoenix from 1982-83 through 1984-85, even returning to the All-Star team in 1983. And the Suns even made a surprise run to the Western Conference Finals in 1984. Although they lost to the Los Angeles Lakers 4-2 in the series, Lucas rammed his way to 17 PPG on 57% shooting in the series. The next year (1985), Phoenix was swept out of the playoffs by the Lakers in the first round, but the 32-year-old Lucas still produced 20 points, 11 rebounds, and three assists per game in the series. After getting burned by Lucas in two successive playoffs, the Lakers acquired the veteran for the 1985-86 season. Finally reduced to a full-time bench role, Lucas performed admirably for LA that season and for the Seattle SuperSonics the next, but he was grinding to a halt. His once quick maneuvers were now more stiff and stilted; he sported a large black brace on both knees. After a homecoming season in 1988 with the Trail Blazers, Mo Lucas finally retired from the NBA. 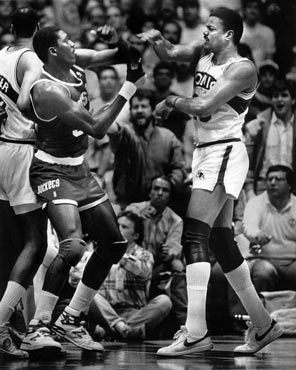 At first glance Lucas may have seemed a mere goon to physically intimidate opponents. As a scorer, Lucas was never likely to overwhelm but you certainly had to respect what he was capable of lest he did overwhelm you. As a rebounder he was second-to-none. The same goes for his defense. Never mind the blocks or steals totals, the man would get up in the opponent’s face, muscle him up, and force bad shots. His dogged, determined play on both ends of the court endeared Maurice to teammates, even if that blustery attitude sometimes caused headaches for management. But Luke was never one to kowtow to authority. He was a rabble-rouser and committed to his on-court compatriots.